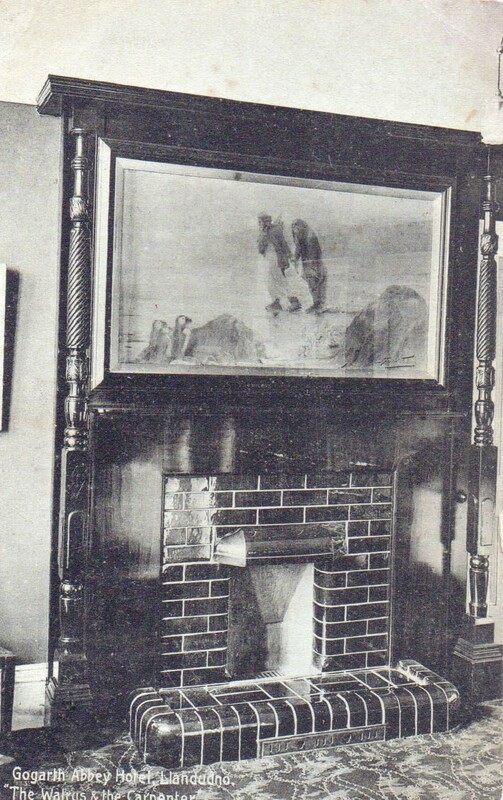 This postcard shows the painting of the Walrus and the Carpenter above the fireplace in the entrance lounge at Gogarth Abbey; it later years it was displayed in the dining room. The card is postmarked 31 August 1911. 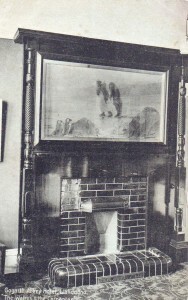 Note the absence of oak panelling on the walls adjacent to the fireplace, and also therefore of the paintings set into the oak panels, they must have been added after 1911, at least in this area (I seem to remember when disassembling the panels from here they were of slightly different construction compared to the area nearer the dining room). This entry was posted in Penmorfa Paintings and tagged Gogarth Abbey, Walrus and carpenter painting. Bookmark the permalink.